Shorelights in downtown Wyandotte,.Photos by Walter Wasacz. The Gold Star Bar has been on Vinewood and Ninth streets since 1923. Frank’s Cafe on Sixth St. at Forest opened in 1933 and began serving fish dinners in the 1940s. 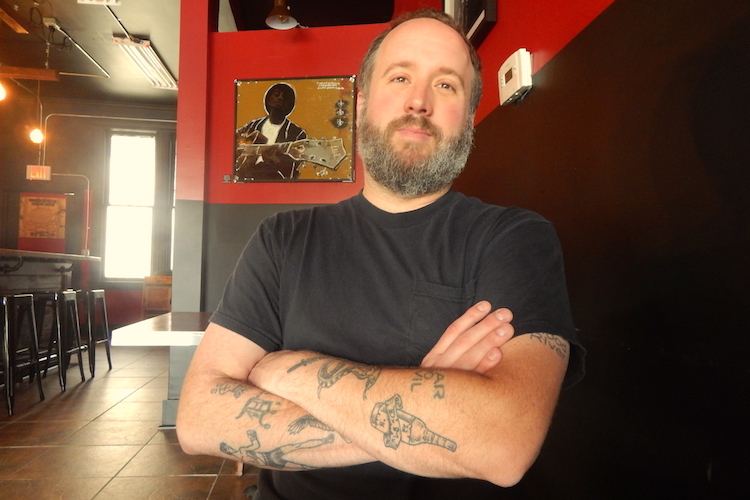 On a sunny late September morning, I stood at the corner of Oak and Biddle in downtown Wyandotte, waiting for the owner a newly opened pie shop to show. I'd met the owner, Don Duprie, a few weeks before. My longtime walking partner Carleton Gholz introduced us at a diner in River Rouge called Zenith Lunch. Gholz is founder and director of the Detroit Sound Conservancy and Duprie, a songwriter, recording artist and Kresge Arts Fellow, recently performed at the annual DSC fundraiser. 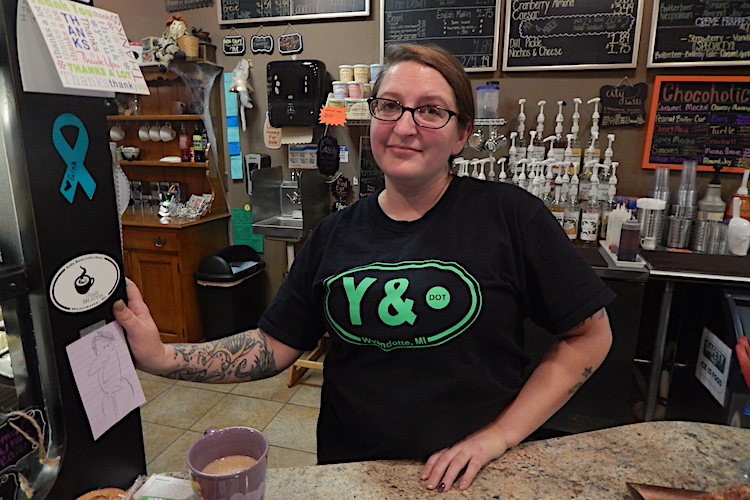 The plan was simple: to meander around Wyandotte, talk about its quality of commercial and residential life, meeting people along the way who might contribute to what I call an open narrative about living here and now. Within minutes, Duprie arrived, checked into his store and we began walking, first into the neighborhood that hugs the Detroit River behind the business district, then into the Biddle commercial corridor itself. On Van Alstyne St. we ran into a friend of Duprie's who was sitting on his porch. He talked about how lucky he was to find this place, that housing prices are accelerating on this block. Across the street, closer to the waterfront, houses are going for double what he paid for his, he says. Don Duprie at his shop, Dangerously Delicious Pies on Biddle Avenue. As we walked, Duprie told me about his relationship to Wyandotte. He's 40, a River Rouge guy who grew up and lives there still. He went to elementary school at Mt. Carmel in Wyandotte then to River Rouge high school. After graduating, he joined the River Rouge fire department, where he worked for 13 years. After he took a buyout from the city, he concentrated on his music, including founding and leading a songwriter's workshop called Inside Outlaws, also the name of his band. He was awarded a Kresge Arts Fellowship in 2012 and has performed at the Concert of Colors as part of Don Was's all-star Detroit band. We walked into Bishop Park, at the edge of the river, where we met a woman sitting on a bench. She says she was waiting for the Diamond Jack, a riverboat that docks in Wyandotte and tours the river. She didn't have a schedule, so we checked our phones and found that the boat did not run that day. She didn't seem too upset about it, seeming to enjoy our brief company. 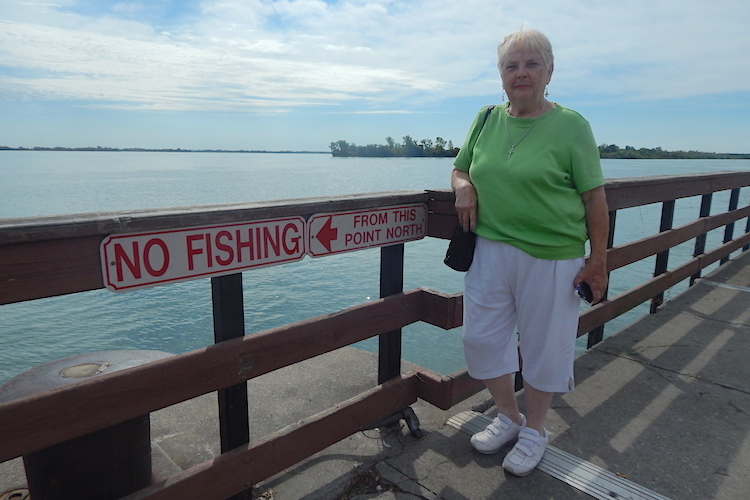 This lady was waiting for the Diamond Jack, a boat that leaves from Bishop Park and tours the Detroit River. We finished our walk with sliders at Joe's Hamburgers, down Biddle a few blocks from Dangerously Delicious Pies, which Duprie popped up initially at Third St. Bar in Detroit's Midtown. A new Detroit store is opening soon at the renovated Strathmore apartment house on Alexandrine St. I took a slice of strawberry-apple pie for later, say my goodbyes and wandered off on my own for another hour. I like having walking partners, but most of my walks are solitary. I consider it part of my work and as a developing art practice, a mobile workshop of sorts. I call it walkable discovery, participating in my own experience as I exercise mind and body, keeping my heart open and flowing as I walk. I returned to Wyandotte a few weeks later, this time on a late afternoon. I wanted to walk into the early evening as night fell on the river. It was a lovely day in early October. I was in good form of late, having just finished a 15-hour performance walk at the Hamtramck Neighborhood Arts Festival called Everything Starts Now. The week prior, I had led a walking tour as part of the Michigan Historic Preservation Network's fall benefit. As my walking life grows my interior life grows along with it. A chance meeting today often finds connections to memories from yesterday, long buried. Mt. 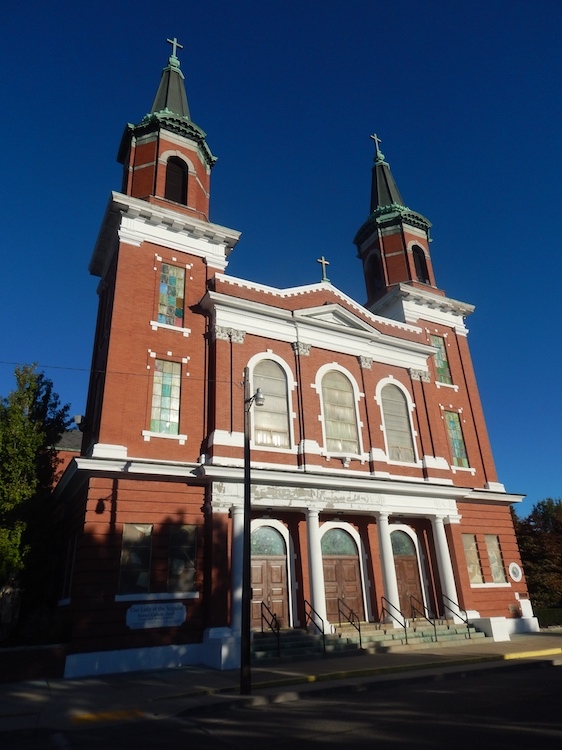 Carmel, one of several Polish Catholic churches in Wyandotte. In the neighborhood surrounding Mt. Carmel, the oldest Polish Catholic parish (renamed Our Lady of the Scapular in 2013) in Wyandotte, is Vinewood Mexican Bakery. I went inside, found some pastries that were set up in cases much like I've seen in Southwest Detroit. There were also loaves of bread similar to those in Polish bakeries in Hamtramck, where I was born and still live. The woman at the register, Xochil Aguinaga, says her husband Luis is the baker, and that for many years he worked at a bakery on Bagley St. In Detroit. He bakes Polish breads as a way of respecting the history of the neighborhood. The sweetness of this simple cooperative gesture should not be lost on any of us. 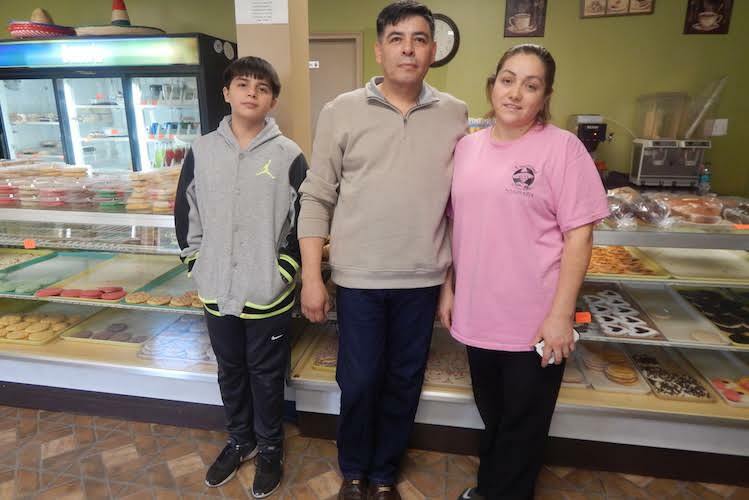 The Aguinaga family moved from Southwest Detroit and opened a Mexican bakery on Vinewood St. I walked into unpaved alleys, which cut through the neighborhoods in both north/south and east/west directions. I love green alleys like this, unfinished and navigable, ideal passageways for surreptitious, contemplative urban explorers on their way to nowhere. At the industrial southern edge of the city I found a path along railroad tracks that divide Wyandotte vertically, into east (closer to downtown and the river) and west (neighborhoods that reach to the city limits at Fort St.) and walked north to streets with idyllic, storybook names like Sycamore, Maple and Elm. Finally, at the river, as the sun began to fall, I saw shore lights come on along a boardwalk in Bishop Park. Across the water is Fighting Island, once home to Great Lakes native populations, later a toxic depository for chemicals produced on the banks of the river since the late 19th century. Cleanups over the past few years have remediated decades of damage. Deer and coyotes are said to again roam the island,a Canadian territory now owned by the German BASF company, the world's largest chemicals conglomerate. Wyandotte is a town that clearly benefits from hosting the chemicals processing industry. The production of soda ash used to manufacture glass by the J.B. Ford Company and Michigan Alkali beginning in the 1890s (the companies later merged in the 1940s to become Wyandotte Chemicals before it was bought out by BASF in 1969) and the generosity of the Ford family set the stage for over a century of prosperity in the city. The local economy remains solid, with good food and retail choices on Biddle, Fort and Eureka and Northline roads that cut west from the river to neighboring Southgate. History is never far from the present in Wyandotte. Descriptive markers are strewn throughout downtown and the neighborhoods. You learn, for example, that Biddle Avenue (which is West Jefferson in Detroit, River Rouge, Ecorse and in communities even farther downriver) is named for John Biddle, a landowner who became the fourth mayor of Detroit and a member of U.S. Congress; and that Van Alstyne St. is named for John S. Van Alstyne, who laid out the master plan for Wyandotte and became its first mayor in 1867. The historical and cultural commission initiated the interpretive marker program and the Wyandotte Museums do active programming, including cemetery tours, year round. 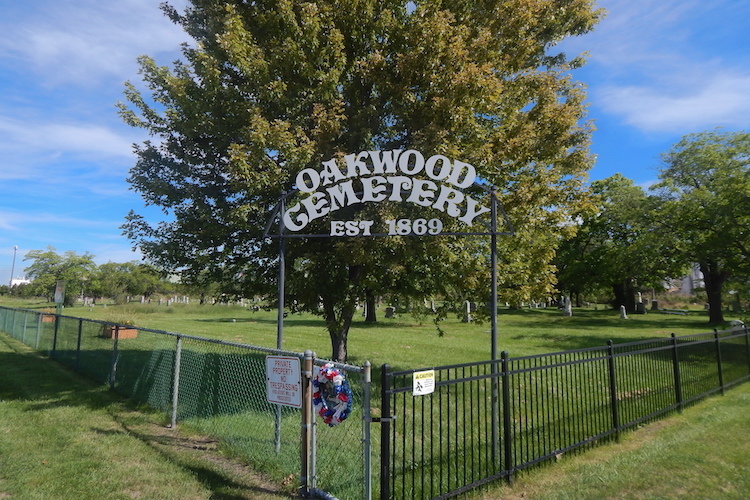 On our first walk, Carleton Gholz -- a dedicated researcher, historian, and preservationist in the Detroit music community -- and I did our own unguided tour of Oakwood Cemetery, one of the oldest downriver graveyards. A veteran of the War of 1812 is buried here, thought to be the oldest veteran grave identified in the region. The cemetery contains stones belonging to people whose families settled in Wyandotte in the 19th and early 20th centuries. The city was incorporated in 1866; after Detroit, it has the second oldest charter in Wayne County. But we sensed older, restless spirits in the air. Gholz and I are kindred psychogeographers, once partnering on a DJ/art project called Paris '68, an homage to the Situationists who drifted and haunted the "varied ambiances" of Parisian streets of the 1950s and 1960s. Before Europeans settled in this region, it was called Maquaqua by the Wyandot tribe, part of the indigenous Huron nation. The U.S. Indian Removal Act of 1830 forced the Huron to leave these fertile lands and waters to relocate to Kansas and Oklahoma. They hunted, fished and traded furs with the French, so this move hurt. The dead were believed to be as important to the Huron people as the living. Some spirits were undoubtedly left behind. But where were the burial mounds? We asked at the museum inside the historic Ford MacNichol Home but a staff person there was unable to assist. The native spirits are still there, I'm certain. As are those of generations of Europeans who came after. More walks in Wyandotte will get me closer to the living and dead. I look forward to that day. Walter Wasacz is former managing editor of Model D. His walkable discovery series began with this piece on the past, present, and future of Detroit's Chinatown. All photos by Walter Wasacz.